Lightweight synthetic saddle designed especially for endurance race competition and long distance trail riding. Smooth leather jockeys and pommel. Tie rings for gear bags. "Silver" conchos. 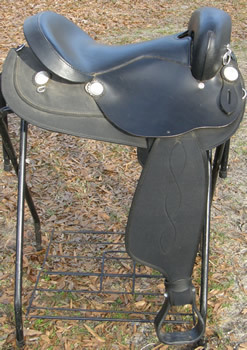 Features: Polymer Form Fit Tree, Full Quarter Bars, Swell 13, Gullet 8.5, Cantle 3.5, Rounded Skirt, Weight Approx 17lbs. 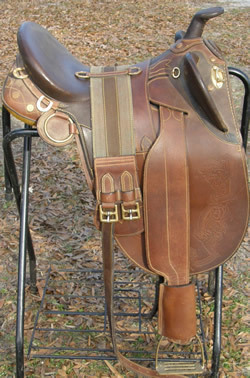 Fully floral tooled leather western saddle with 15” suede seat, square skirts, buckstitching & back girth billet straps. No front or back girths or front billet/tie strap. 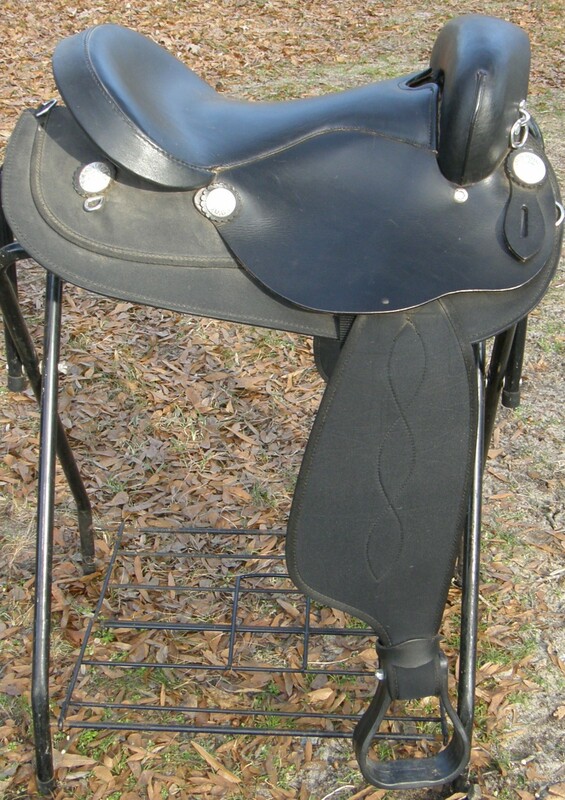 Feels like a sturdy, well made saddle, seat similar to an equitation saddle, and it is in good condition. 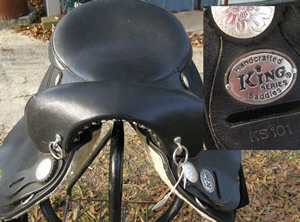 Has Hereford Brand Tex Tan Yoakum stamped on the left stirrup fender & numbers 11611 1165 9001 stamped behind the cantle. This has braided leather saddle strings, & leather covered stirrups with a 5" tread. Some of the saddle strings need repair or reattaching to saddle, some holes in fleece on underside, & there is some wear or chew marks on left rear billet strap near the top(see pix), otherwise appears to be clean & in good usable condition. Lots of tooling & buckstitching & with just some minor repairs will make a super vintage saddle. 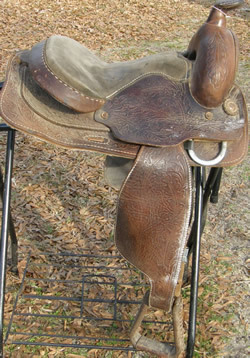 Tex Tan confirms that this saddle was made in the Yoakum, TX factory in 1965 & was called a Pleasure Saddle. Very heavy, this will have to ship USPS parcel post, UPS Ground, pick up in store or can possibly meet in MD or some areas of PA, delivery fee may apply. Like new condition, only ridden in a few times & only way to tell that is inside stirrups are slightly dirty. Has matching bridle, see WB163. 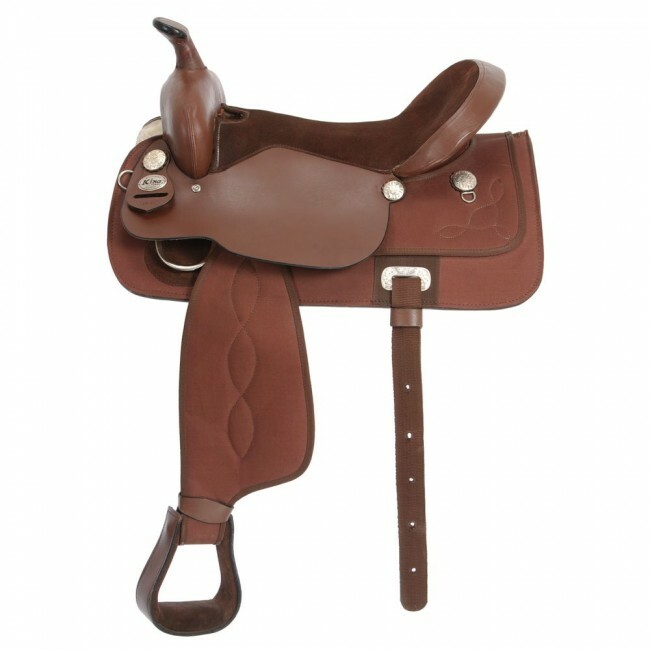 Western style Aussie stock saddle for those riders who spend long hours riding and need the comfort and closeness to the horse the stock saddle offers. Reinforced knee pads, deep seat, brass plated(?) hardware and lightly tooled smooth leather. Complete with wide metal stirrups & girth. Provides maximum reductions of heat area for the horse with rear skirts that cover only the fan area of the tree bars and the gullet opening cut well back under the fork. Easily provides 30% better heat venting than normal saddles. Leather Western saddle designed especially for endurance race competition and long distance trail riding. No horn variety, slightly padded seat, 2 snap pouches on front of pommel for a knife & hook pick or similar items, rear ring for attaching a crupper, & lots of saddle strings for tying on equipment or gear bags. Doubled & stitched leather off billet has elastic inserts for better flex & give. Sturdy latigo tie strap. Comes with both back billets & rear girth or cinch. Girth rings are all brass. Specs per American Saddlery: Tree: 16" Hardwood fiberglass-covered Professional Endurance, Swell: 12 1/2", Gullet: 6", Cantle: 2 1/2", Skirt: 23"L x 11"W, Stirrup Leathers: 2 1/2" with Blevins buckles, Stirrups: Visalia with leather foot pads, Rigging: Brass rings in 3/4 position Weight: Approximately 31 lbs. 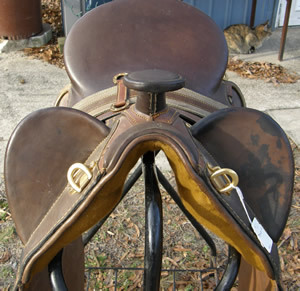 Front saddle strings have been chewed by horse & left side of pommel also has chew marks on it. This leather western saddle features: padded suede seat, tooled leather, Square skirt, "silver" conchos. Suede padded seat on this round skirt western saddle that was used for roping but could be used for barrel racing or speed events. It comes with laced stirrups, leather tie strap, off billet & rear billets, & tooled leather. Stirrup leathers have 2 hole/roller buckle setup. Horn is wrapped with rubber but can be removed. Well used but in good usable condition. Latigo holder is stamped The American 1408. 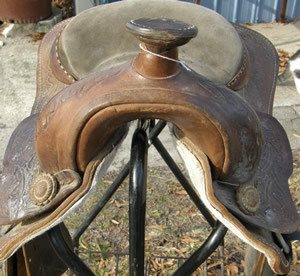 Leather western saddle with no stirrups & is very well worn with small cuts or tears in the seat. Great to use as a decoration, attach to barrel or other object so kids can ride on it(such as lawn mower trains), or use to break out young horses. Tree seems to be fine, saddle has just been very used & stored badly. We are selling this in AS IS condition with no guarantees. 15” seat. Stirrup straps are very worn with some pulled holes. This leather saddle features: suede seat, Square skirt, extra heavy skirting leather, leather covered stirrups, smooth untooled finish(makes cleaning easier), weighs approx 40 pounds. Leather is stiff & has some staining. Needs a good oiling. Black leather Parade style Western saddle with red leather seat, white leather saddle strings, tie strap & concho pieces with strings, “silver” diamond trim pieces edging saddle skirts & fenders, tooling on skirts, fenders, tapaderos & pommel, tapaderos or hooded stirrups & comes with 27” string girth & matching Western Bridle with “silver” diamond trim & 5” curb bit. Excellent used condition. Suede padded seat on this square skirt western saddle that has a burgundy/black/white south western style print skirts & fenders. It comes with black leather seat jockeys & trim, leather reinforced nylon stirrup straps with single hole Blevins buckles, black poly stirrups, nylon string ties on back, black nylon tie strap & brown doubled nylon off billet. latigo holder is stamped Amtech 284.1. Great light weight saddle with deep seat for gaming or trail riding in excellent used condition. Has matching saddle pad for sale separately, see WP279. 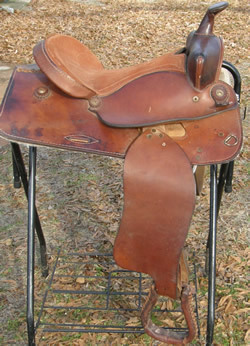 Padded slick seat on this square skirt western saddle that has tooling, leather covered stirrups, & 2 hole Blevins buckles on stirrup leathers. Comes with leather tie strap & doubled nylon off billet. Some scuffs to pommel & cantle, stitching on both stirrups have been redone but is coming apart again & saddle is well used but still good usable condition. Stamped Simco 535 on latigo holder.